It’s a classic chicken and egg problem: Every where you look in the night sky, galaxies often seem to come with a supermassive black hole (SMBH) at their centers–or do the black holes always seem to come with a galaxy? It has become increasingly clear over the past decade or so that galaxies and SMBHs are very intimately related, however the nature of this relationship is less clear. 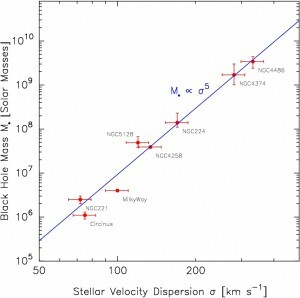 The greatest achievement that astronomers have had so far is the discovery of the M-sigma relation, which relates the mass of a galaxy’s supermassive black hole (M) to the velocity dispersion of stars (sigma) in the galaxy’s bulge (we’ve written about this relation quite a bit on Astrobites: here and here). The idea behind this relation is that the black hole, being located in the center of the galaxy, affects the orbits of stars nearby in the bulge. A very massive black hole corresponds to the distribution of stellar velocities being very spread out. The M-sigma relation is helpful in determining the masses of SMBHs in galaxies that are too distant for direct mass measurements. All that is needed is a measurement of sigma. The relation in its present form does have potential flaws, however. There are many galaxies that do not appear to have SMBHs at their center, and it’s not clear whether the M-sigma relation allows for this or whether the SMBHs are simply too small for us to detect. That is the problem with empirically-determined relationships; they’re only as good as the data you have so far. Perhaps the M-sigma relationship behaves differently on the low-mass or high-mass end of things; some recent observations suggests that it may. Several astronomers have measured the properties of the galaxy NGC 1277, a lenticular galaxy located 220 million light years from the Milky Way in the constellation of Perseus. The observation of this galaxy was part of a larger, ongoing survey known as the HET Massive Galaxy Survey. So far, about 700 observations have been analyzed. 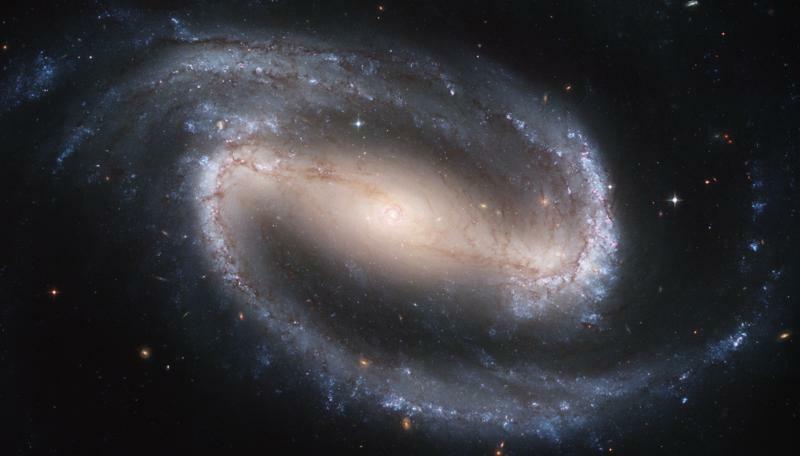 Six galaxies in particular stood out to the authors as having some peculiar properties. What caught the attention of the authors is that these galaxies had effective radii less than 3 kpc and velocity dispersions greater than 350 km/s. Basically, they are very small, but appear to have a very large SMBH within them. Out of those six, NGC 1277 was the most impressive. Using high-resolution imaging of the galaxy from the Hubble Space Telescope and the stellar kinematics data collected in the survey (this process was detailed in a previous Astrobite), the authors were able to determine the mass of the SMBH in NGC 1277 to be 17±3 × 10^9 M⊙. This discovery is noteworthy for a few reasons. Not only is it quite possibly the most massive black hole ever observed, but it is also nestled inside a rather small, compact galaxy. The mass of this behemoth black hole accounts for 14% of the galaxy’s mass and 59% of the bulge’s mass. In comparison, most black holes are only 0.1% of the bulge’s mass. Other heavyweights have reached only as high as 11% (NGC 4486B). 59% is truly remarkable. A big fish in a small pond, the black hole in NGC 1277 has earned the nickname over-massive black hole by the authors. NGC 1277 as seen by the Hubble Space Telescope. In the center of this galaxy lies the “over-massive” black hole, weighing in at 17 billion solar masses and comprising 14% of the galaxy’s total mass. If the black hole wasn’t noteworthy enough already, its mystery deepens when placed in the context of the M-sigma relation. The relation predicts that NGC 1277 should host a central SMBH with a mass of 2.4 × 10^9 M⊙. The SMBH exceeds that by a factor of seven. This monster of a black hole does not play by the “rules” M-sigma relation. It’s not the only one, either! Previous studies have shown that NGC 4486B and Henize 2-10 also exceed the M-sigma prediction by a large margin. There are even some galaxies that fall short of the mass predicted by the M-sigma relation. The implications of this are not clear. Could it be that the M-sigma relation doesn’t hold for relatively large or small SMBHs? Perhaps the relation does hold and the black holes in question are just outliers, located in the tails of the distribution. There is really no way to know yet. The authors admit: to answer that question, more black hole measurements are needed, starting with the other five interesting cases they identified, but have not yet studied in detail. Regardless, there is no doubt that SMBHs and their host galaxies have an intimate relationship. 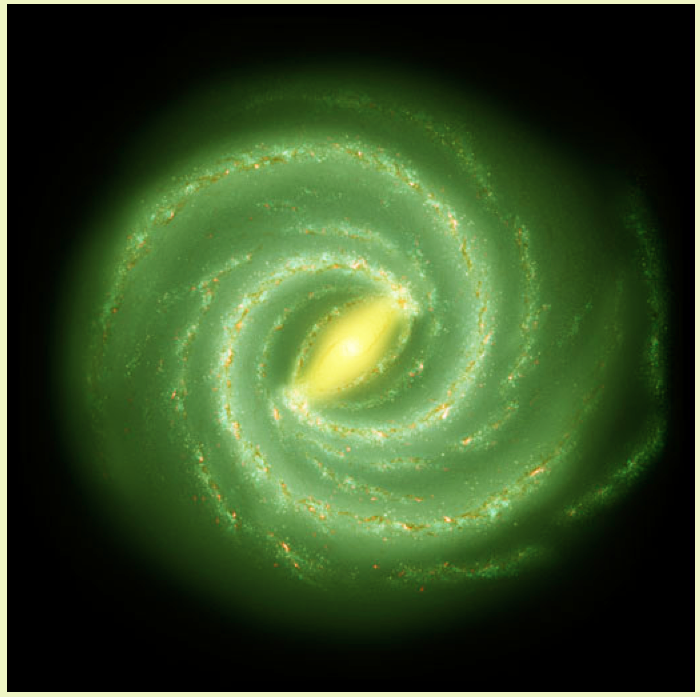 Understanding that relationship may ultimately lead to a better understanding of how galaxies evolved and what role, if any, SMBHs played in that evolution. And so the question still stands: Which came first, the SMBH or the host galaxy? And how does a galaxy and a SMBH affect the other’s evolution? It’s a big puzzle and many pieces have been found. The trick is fitting them together. Justin is a physics graduate student at Indiana University. He has been involved with the HALO experiment at SNOLAB in Sudbury, Canada. As part of the SuperNova Early Warning System (SNEWS), HALO will detect neutrinos produced by supernovae and help alert the astronomical community. Justin's other research interests include heliophysics and the formation of massive stars.